Feldspar ore is the main source of feldspar mineral concentrate or purified feldspar used in the manufacture of various grades of glass and ceramics including high-end ceramics and electronic-grade glass fibers. The glass and ceramic industries, in particular, are major consumers of feldspar, accounting for 95% of total consumption. In recent times, the increasing rate of depletion of high-grade feldspar ores has resulted in lower-grade ores becoming the primary source of feldspar. This has placed added pressure on producers to further optimize existing feldspar processing methods like flotation to more efficiently produce higher grades of feldspar for the specialty glass, ceramics and electronics markets. When manufacturing high-grade, colorless glass it is important to have very low levels of iron oxide in the feldspar. Avoiding the presence of iron in the batch composition of glass is preferred because iron, even in very small quantities, can color glass and cause production problems. When manufacturing white wares, although higher percentages of iron content in feldspar may be permissible, the levels of iron allowed are still very low. Flotation concentration is the most widely used and preferred method to purify raw feldspar ores in addition to the magnetic and gravity methods. In response to market needs, ArrMaz applied its expertise in industrial mineral flotation and feldspar processing to custom develop anionic and cationic collectors that effectively and efficiently recover higher grade feldspar for a variety of end use applications. Our specialty collectors facilitate simplified process conditions, reduced acid use and most importantly, improved process economies. In addition to flotation collectors, ArrMaz also produces a broad range of wet and dry processing chemicals used in feldspar processing including frothers, defoamers, filtration and de-watering aids. 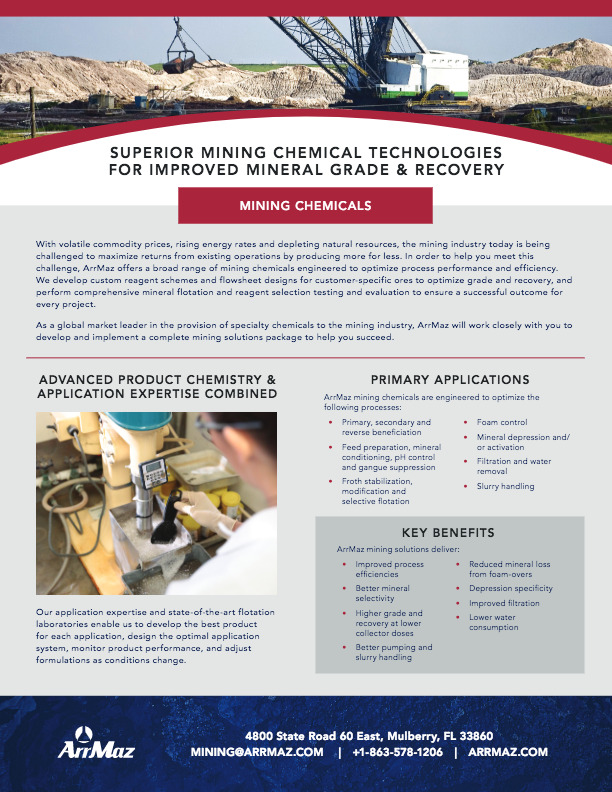 These chemicals are tailor-made for each individual application based on specific ore characteristics, in compliance with all applicable regulatory and agronomic requirements. ArrMaz’s technical experts also function as process advisors, working closely with our customers to optimize process performance and maximize feldspar grade and recovery.